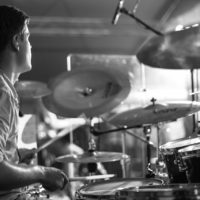 The Moeller technique is a great drumming method that can swiftly improve your skills and teach you how to save energy while drumming. Also, learning this technique is a great platform for some more advanced drumming styles. 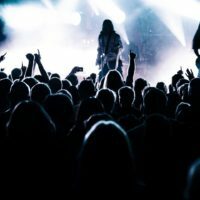 This article explains how you can learn the Moeller technique, as well as explaining its origins. Have a look at this video to see the Moeller method in action, before we dive in it. Jim Chapin is one of the main pioneers of the Moeller technique. This drumming technique was named after Sanford Augustus “Gus” Moeller. He was a drummer and an educator, professionally active from the 1910s to his death in 1960. What he did was observe the military drummers in the years after the American Civil War. He admired the way they played their snares at military events and parades. If you’ve ever seen those parade drummers hitting large snares, you must have asked yourself how they don’t get exhausted from hours of walking and drumming. That same question came to Mr. Moeller’s mind. 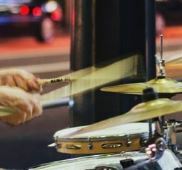 After analyzing their playing technique, he realized that the predominant grip those drummers used was the little finger-thumb grip. In other words, they would hold their drumsticks with those two fingers when hitting their snare drums. Frankly, Moeller didn’t invent anything new, but he simply recorded what he noticed in those players. In the 1930s, he met Jim Chapin, one of the most influential jazz drummers of the 20th century, and taught him this drumming style. This influence Chapin had on drumming was largely anchored in the Moeller technique. He embraced this technique and kept popularizing it until his death in 2009. Now that we’ve learned a bit more about Chapin and Moeller, let’s concentrate on the drumming benefits of the Moeller technique. Before we move onto those details, it’s important to stress out that every drummer needs to find a fulcrum point. In a nutshell, it’s the position in which you have the best balance and control over your drumsticks. Playing drums without finding this point will be exhausting for your hand and frustrating for your mind. Defining the fulcrum point is inevitable when it comes to the Moeller technique because this method depends on the stick grip and the bounces. When your stick bounces off a drum, it’s crucial to use the reflection momentum for the new swing and the kick of the stick. 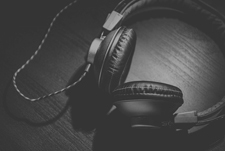 Here are the strokes contained in the Moeller technique that can improve your drumming. The Moeller full stroke will help you gain better control over your sticks and use their force to increase your drumming speed. Before you hit the drum, put the stick in a vertical position. Hitting the drum should be done in a whipping style. Just imagine that your stick is a whip and try to imitate that whipping move. By performing this kick on the drum swiftly, you’ll release a large amount of energy that will eventually be transferred to the drum. The reflection of the stick will be equally powerful, generating a new amount of potential energy for another hit. Here you can see Brad Allen playing those full strokes in accordance with Moeller technique. Make sure that you do this drumming practice using both hands from the very beginning. Otherwise, they won’t be equally trained, which will be a drawback for your playing. The counterpart of the full stroke, the Moeller up stroke begins a few inches away from the drum. What you should first do when performing this stroke is gently tap the drum (or the pad) with the tip of your stick. After that, lift the stick back to the initial vertical position from which you perform the full stroke. The potential issue for drumming rookies is the low initial position of this stroke. Still, practicing this stroke will make this position completely natural after a while. Also, use the aforementioned whipping move for this stroke. The more your practice both the full stroke and the up stroke in your rehearsals, the better technique you’ll acquire. The name of this stroke is quite self-explanatory: you simply “tap” the surface of the drum with your stick. Similarly to the up stroke, you should place your stick just a few inches above the drum and only barely hit it. You can accompany this stroke with the up stroke. Again, practice it with both hands and you’ll soon be able to combine all these strokes to make the Moeller technique work for you. As you’re practicing the three Moeller stroke, you should concentrate on the feeling you have in your sticks. 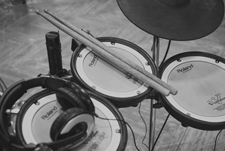 Although this feel will depend on the position of the sticks, don’t pay too much attention to the height between them and the drum at the beginning. The initial goal here is to find the fulcrum point and develop the right drumming sensitivity. After going through each of these strokes separately, it’s time to play them one after another, to form the right Moeller pattern. When you put all them together, it will be first the full stroke, then the tap stroke and at the end, you’ll go for the up stroke. As you’re playing them in a single drumming unit, you’ll see how your sensitivity is increasing. Soon you’ll be able to perform all three strokes smoothly with each hand. 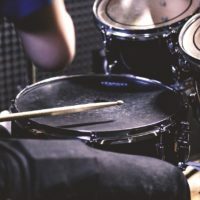 This final outcome should be the following drumming feel: you’ll have an impression that you’re actually hitting only one stroke (the full stroke), while the two latter strokes (the tap and the up stroke) are more similar to bounces. 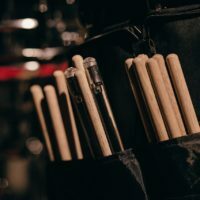 The ease with which you’ll eventually be able to drum is what makes the Moeller technique so popular among modern drummers. 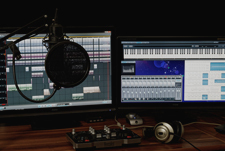 You’ll be able to play drums for a longer period of time, due to the optimal input of energy.